This DLC pack adDS “Revealing Outfit” costume for 2B, “Young Man’s Outfit” costume for 9S and “Destroyer’s Outfit” costume for A2. 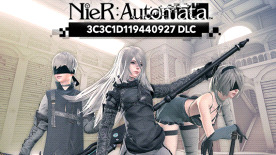 AfteR completing new sub quests in this DLC, you CAn enJOy playing the game while wearing these costumes from NieR Replicant. Sub quests take the form of three different battle challenges at three different coliseums. Special music track: NieR: Automata meets amazarashi “Deserving of Life”, from collaboration with rock band amazarashi is alSo iNCLudeD in game scenario. We woULD bE delighted to see yOu hAVinG fuN with this content. Also included is the amazarashi head pod skin accessory allowing you to alter the appearance of your pod to look like an amazarashi head.